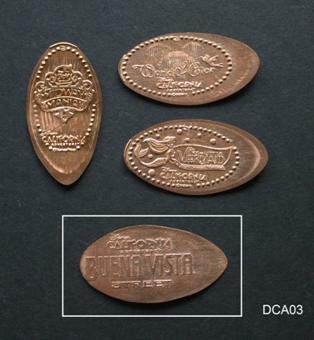 BACKSTAMPS: All Disney coins from California have backstamps except Rainforest Café, ESPN Zone and the 2 hand-crank machines at Downtown Disney. 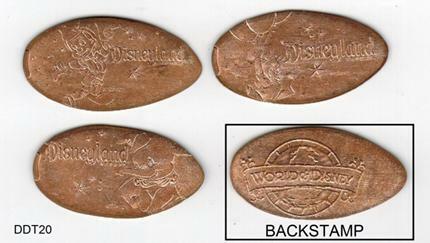 Other machines are former Eurolink machines, and often have a stylized “D” where the Eurolink “e” would be. 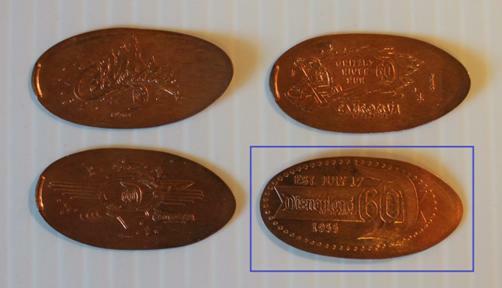 Most of the Disney coins roll long on copper pennies, leaving a long tail. 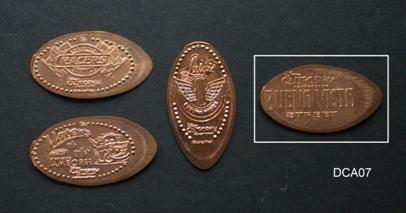 All pressed on uncirculated copper pennies. 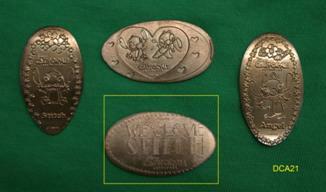 The Luigi’s Flying Tires design was retired in December 2015 after that attraction had been closed. 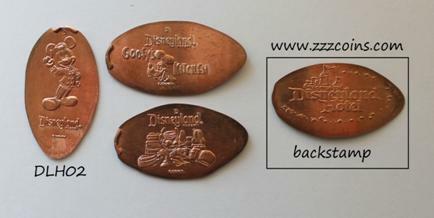 The replacement coin – Luigi’s Rollickin’ Roadsters – is available as part of set DCA07A (above). 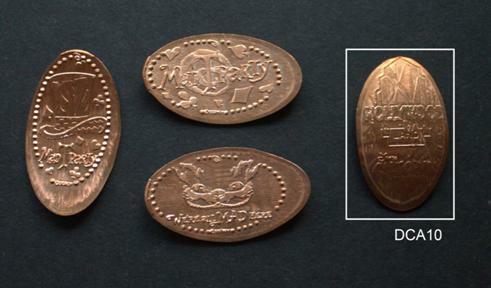 Mad T Party theme – the Mad T Party was a nighttime entertainment attraction that ran from 2012 to 2014. 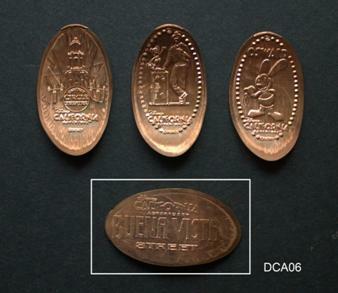 It included arcade-style games for which special arcade tokens were produced. 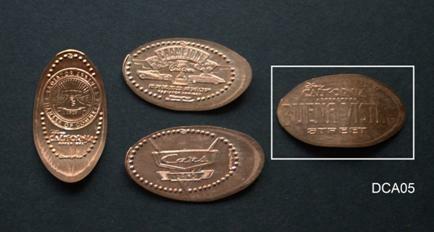 The coin designs were retired in 2016. 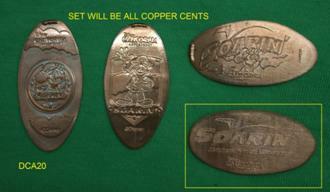 Mad T Party game tokens are available on my arcade tokens sales page. 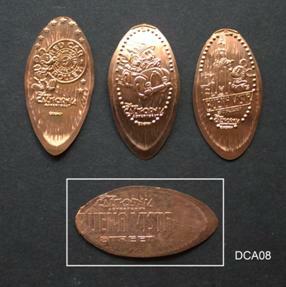 Also available: a set of 3 Frozen quarters from Disneyland. Retired in 2017 – replaced by the Guardians of the Galaxy ride and store. 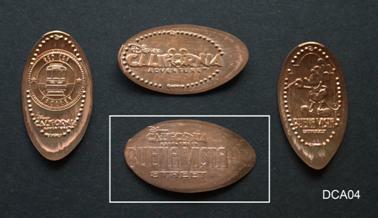 Includes the only two Duffy coins at the California parks. This machine was retired when Paradise Pier converted to Pixar Pier. Toy Story theme – Woody, Rex and Buzz. 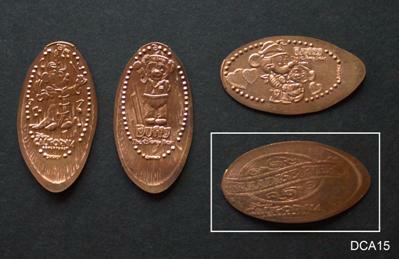 Scrooge McDuck, Donald, and Huey Dewey & Louie. 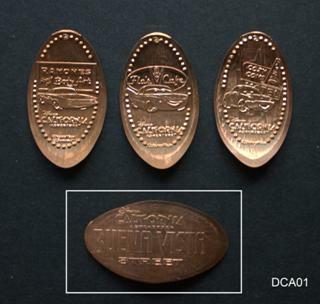 One of only two machines with 3 different backstamps (the other is the Tron machine at Starcade). 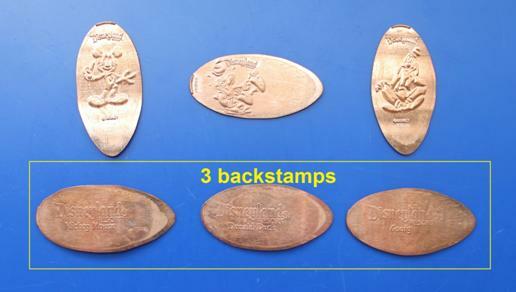 Although hard to read, the backstamps say “Disneyland Resort,” and “Mickey Mouse,” “Donald Duck,” and “Goofy” respectively. 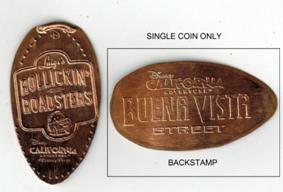 The designs do not have any Disney affiliations. 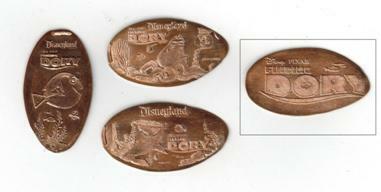 Four pennies (and the quarters) have “Anaheim” on them; the other four pennies have no city name. This 4-die hand-crank machine also lacks backstamps. 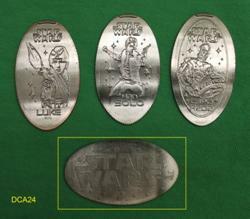 There are a couple Disney affiliations with these designs. ESPN is owned by Disney through its ownership of ABC TV. 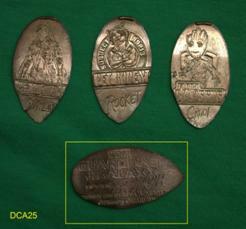 In addition, the Angels baseball team was owned by Disney for about ten years. 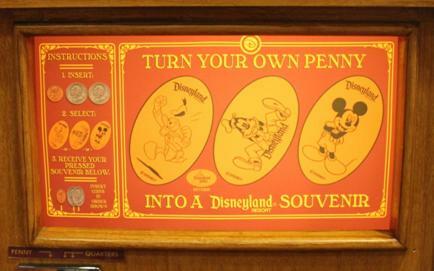 The two outdoor machines at Downtown Disney are operated by Pennymen (a private company). 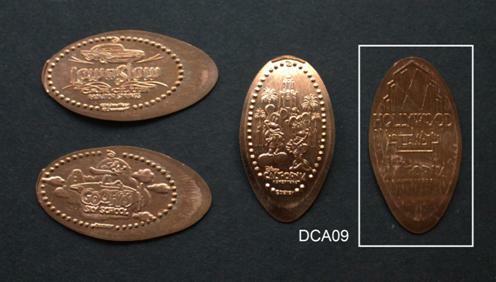 They are 4-die hand crank machines, and the coins lack backstamps. Two machines are located outside the restaurant. Two machines are located outside the restaurant. This machine has a Ratatouille theme. This quick-serve restaurant was closed in September 2018 and the fate of the machine is unknown.